May I present Ms Mou Bolide? Her measurement's 31cm and like her owner, she has a bad posture with a tendency to slouch. I'm a bit overdue with the introduction as I've had her for a few months now. 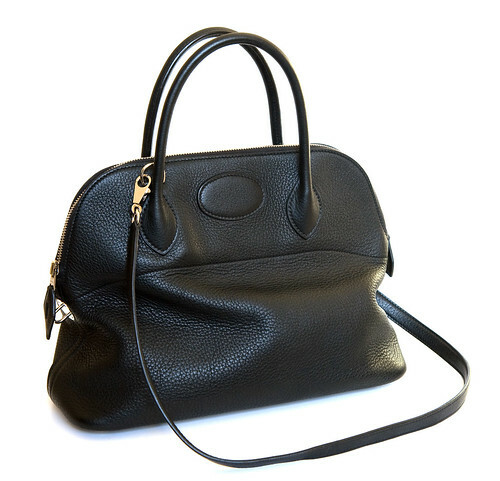 After a slew of brightly colored Hermes bags, I decided it's high time I get back to basics - black. Above all, Ms Bolide ticks all the boxes. Light enough to carry around without hurting my shoulder and back. Check. A detachable strap long enough to wear across the body. Check. Understated. Check. Timeless. Check. She's the antithesis of "it" bags. I'd like a classic style that will still look fashionable when I'm in my 60s. The Bolide was originally called Bugatti, named after the French racing car. It was designed by Emile-Maurice Hermes in 1923 and was considered revolutionary as it was the first bag designed with a zip enclosure. i actually like it much better than the kelly--is tt a crime punishable by death? LOL. Terri, I like both the Kelly and Bolide but I can easily see what you'll chose the latter. It's very much an under the radar bag. Very elegant but understated. Thank you, Linda! I hope you've had a Christmas and NY break. Thanks, DA! I was thrilled to find the exact combination (black togo with silver hardware). My very first black Hermes bag. Woohoo!